Family Home Day Care was introduced in 2007. Research by the Canadian Child Care Federation indicates that there are currently 170,000 Family Home Day Cares in Canada; 15,000 of those are regulated. Here in Nova Scotia, there are 13 Family Home Day Care Agencies, 5 are located in South West Nova Scotia. Why approve Family Home Day Cares? It gives parents the option of formal child care service in a home-like setting, where care is monitored to ensure it meets established standards. It provides another option for child care for parents eligible for assistance with fees (families with one child who earn less than $62,731.00 may be eligible for subsidy). It supports parents who are employed or training for employment (through offering subsidies to parents actively looking for work for 6 months). It promotes children’s health, safety, and well-being. In the Annapolis County, there are 9 communities and 86 sub-communities; yet there are only 4 licensed Day Cares to service the families and the children who live in our communities. This results in limited options for families. These figures clearly demonstrate the need for quality care in our communities. By offering families more care options, we can increase the number of child care spaces available to families. This can mean several things. It may mean more quality care, as approved care means monitoring by the agency as well as the Department of Education and Early Childhood Development Services. This is done not only by monitoring, but also by an Early Childhood Educator assisting care providers through program support, menu planning, play groups, a lending library, and consultations. There will also be support for both Care Providers and the families and children they work with by networking, the parent advisory committee, workshops, newsletters, and regular meetings. Approval through the agency can also mean more affordable quality care options to families, as eligible families can apply for subsidized financial support when they are using approved Family Home Daycares. This is good for both families and Care Providers because it offers financial support for families and Care Providers-families can receive help paying fees for child care and Care Providers have more security knowing the services they provide will be paid for. There is also the encouragement of parents and Care Providers to become more involved; in playgroups, by volunteering, the advisory committee and by participating in workshops relating to their work with children. This is good for the families and children in Annapolis County. It is said that it takes a community to raise a child; Family Day Care enables children to be raised in their communities by their communities. 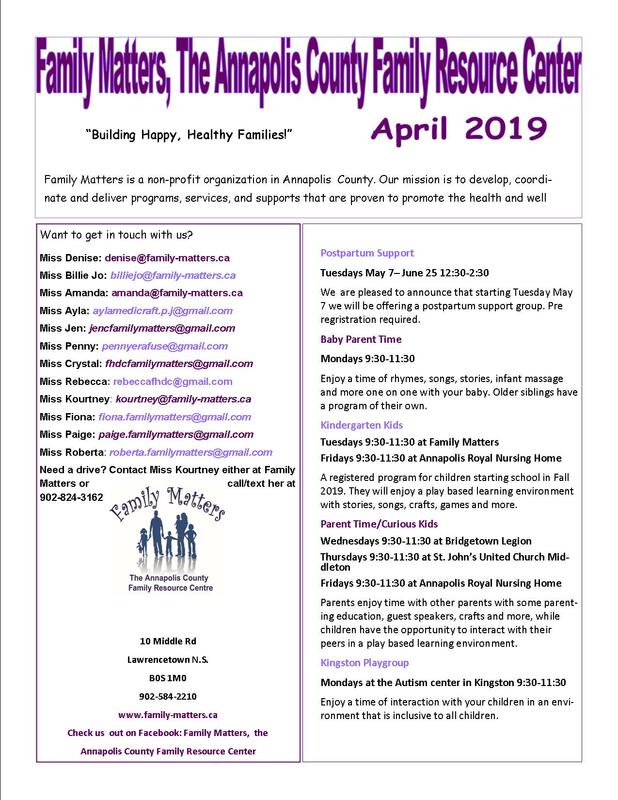 Why has Family Matters The Annapolis County Resource Centre become an agency? Well, most importantly, this enables us to support the families and communities we live and work in through providing more quality and more affordable care for their children. We are helping to support families to stay in our communities and are encouraging families to move to our communities by giving them more options for quality care for their children in their chosen communities. This makes economic growth more viable. Also, by hosting an agency, we are able to pool our resources- in our knowledge, our community partners and our finances (for example: our lending library). By acting as a liaison with our community partners, we are helping to keep these resources in our communities. Taking a “use it or lose it” perspective by directing families to our community partners services; we are helping to keep funding going to the services that Annapolis County families are using. By creating an agency that considers the whole family – as an individual, as a family, as a citizen and as a community member; a positive impact is created as we work together.